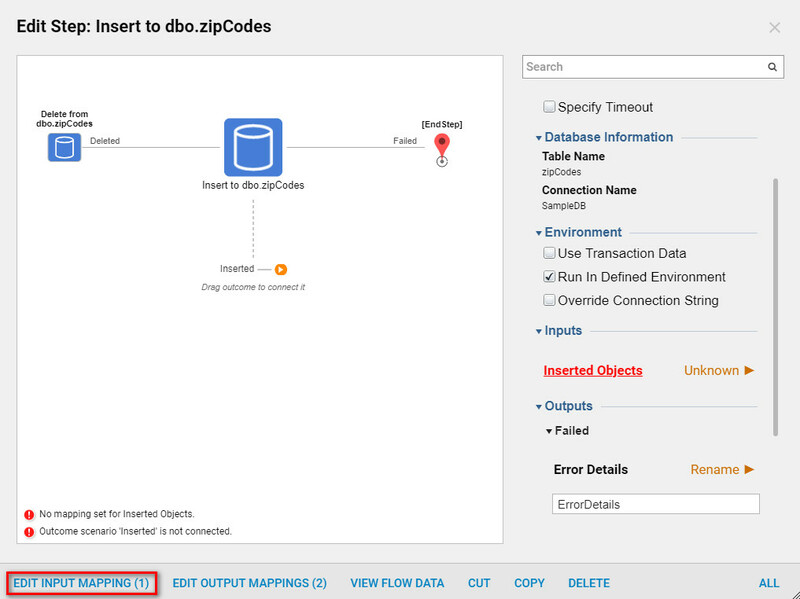 After an External Database	has been created and integrated into Decisions, use specificFlow Steps	to integrate the external data into the flow. 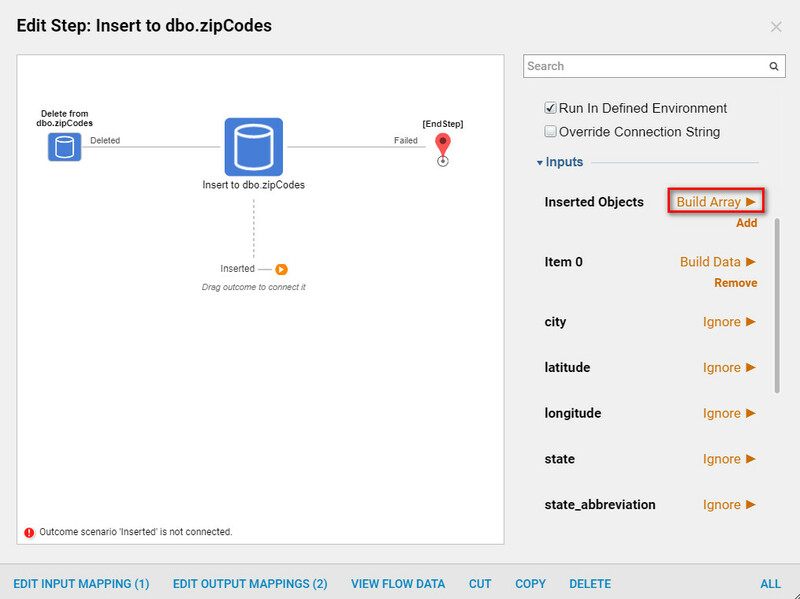 When integrating with a Database in Decisions use Flow Steps to Update, Delete	andInsert Steps	that interact with the integrated Database in the Flow. 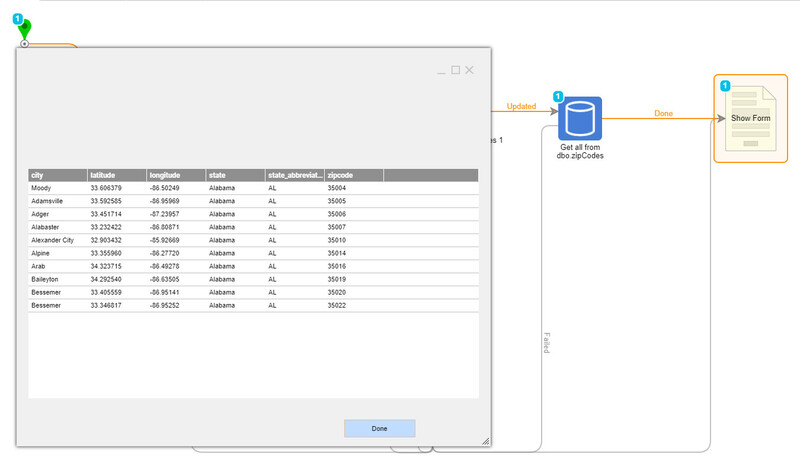 Display data from an integrated database using a Data Grid	component on the Form . 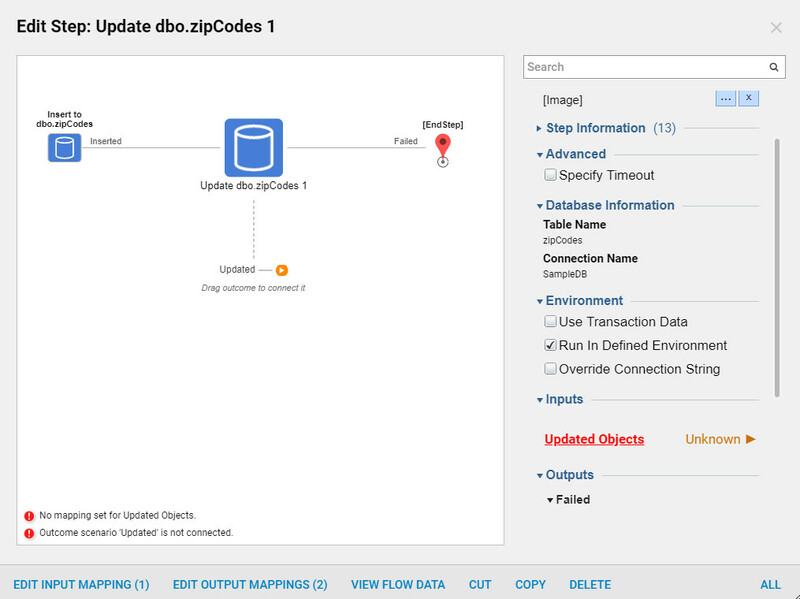 Create a Flow and use the Insert, Update	andDelete	Steps	against the Database we just integrated with. We navigate to the designer folder and select the Create Flow	button from the Folder Actions Panel. Name	the Flow (Insert Update Delete Steps Flow), and select Create	to proceed to the Flow Designer . 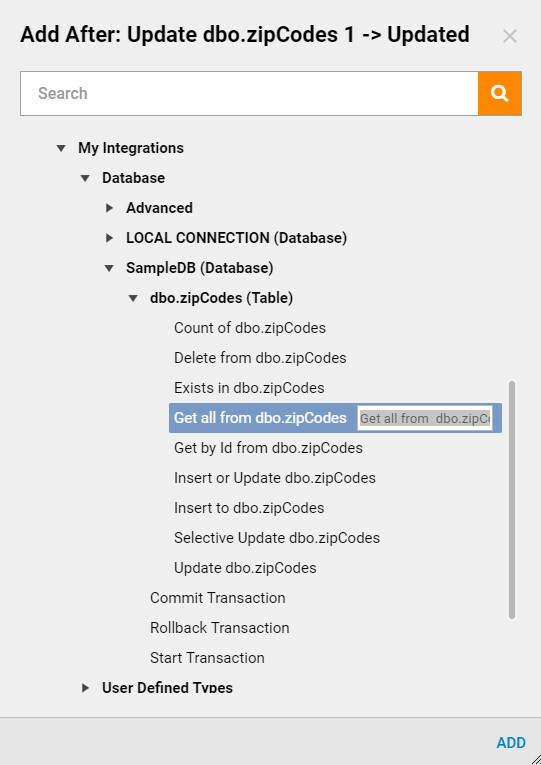 In the Flow Designer we expand Integrations > My Integrations > Database > Integrated Db Name(Database) > integrated table name	category. Here we can find all steps	to interact with the integrated Database . First, we add Delete [table name] Step. Then, connect Failed	outcome from the Delete	Step	to the End	step in our Flow . Select the Delete step	in the flow designer and locate the step properties (Figure 9). The record that will be deleted with this step should be identified by the Primary Key ID	from the table (in this case UnitID is a primary key in the integrated table) . For the UnitID	we select Constant	Mapping type and provide desirable Value	. Then, we click Add Step	. 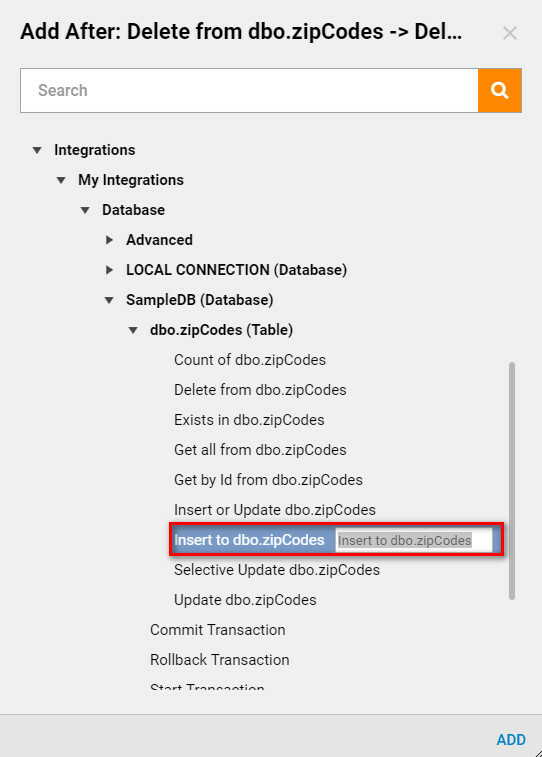 Now add an Insert to [table name]	step fromIntegrations > My Integrations > Database > Integrated Db Name > Insert to dbo.zipCodes [integrated table name]. Connect the Deleted	Outcome	pathway from Delete step. In the same manner, as we did with the Delete step, get the Failed	outcome Step	from the Insert Step	and connect it to the End	step. 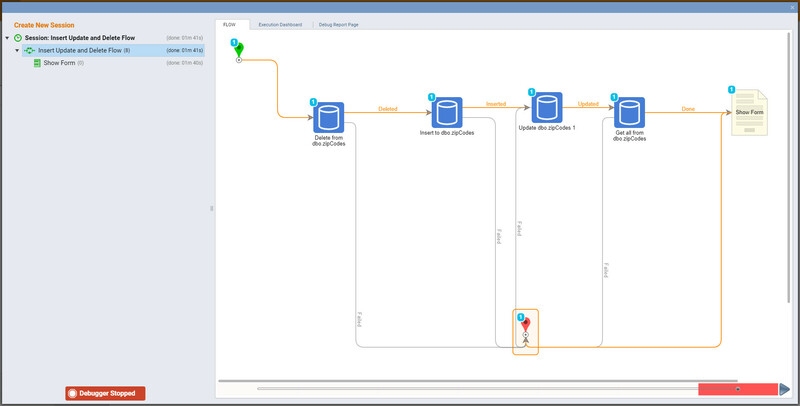 Select the Insert	step in the Flow designer and set the properties of the step. Select Edit Input Mapping. This step is able to insert an Array of records into the table. 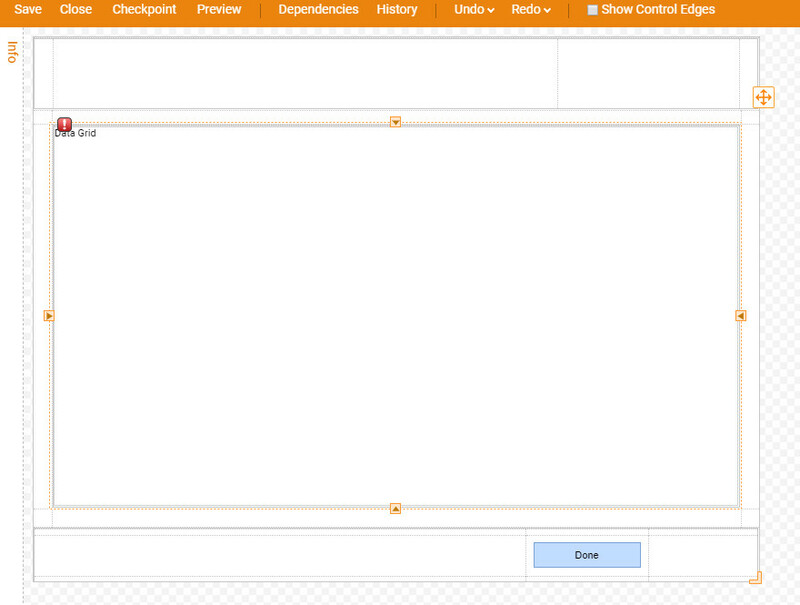 In the properties tab under Inputs, select theBuild Array	option for Inserted Objects	. Then for the first record (Item 0) in the Array	select Build Data	, and create a Record by filling in each field with Constant Values	. 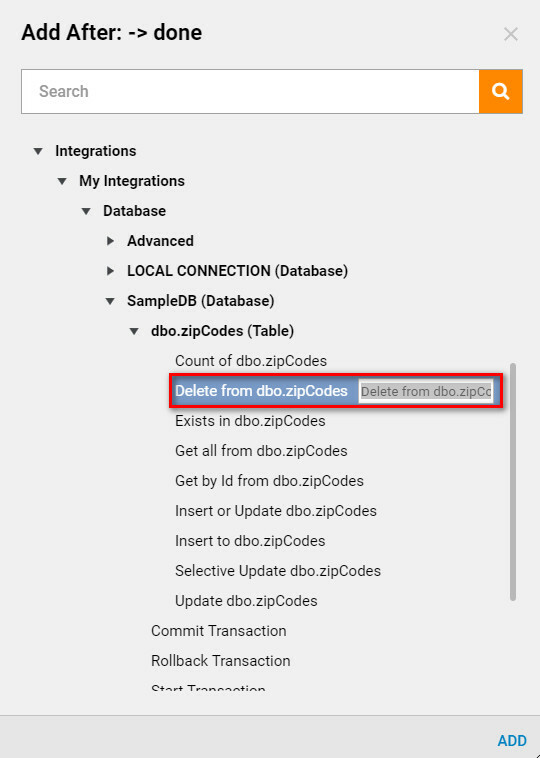 Back in the Flow designer we add Update [table name]	step from the Integrations > My Integrations > Database > Integrated Db Name(Database) > Update dbo.zipCodes [integrated table name]	on the Inserted Outcome	from Insert step. Again, connect the Failed	outcome from the Update	Step	to the End Step	in the Flow. Edit the Step properties tab. Update step is very similar to Insert step. Under Inputs configure data for this step in the exact same manner as we did for the Insert step. To display data from the table we need to query it first. 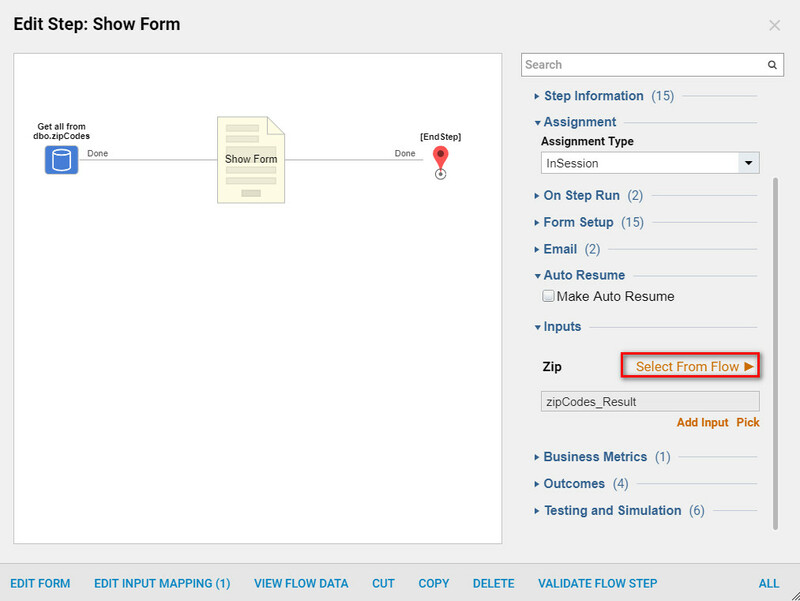 In order to obtain data from the table first add a Get all from [table name]	Step tab the flow. 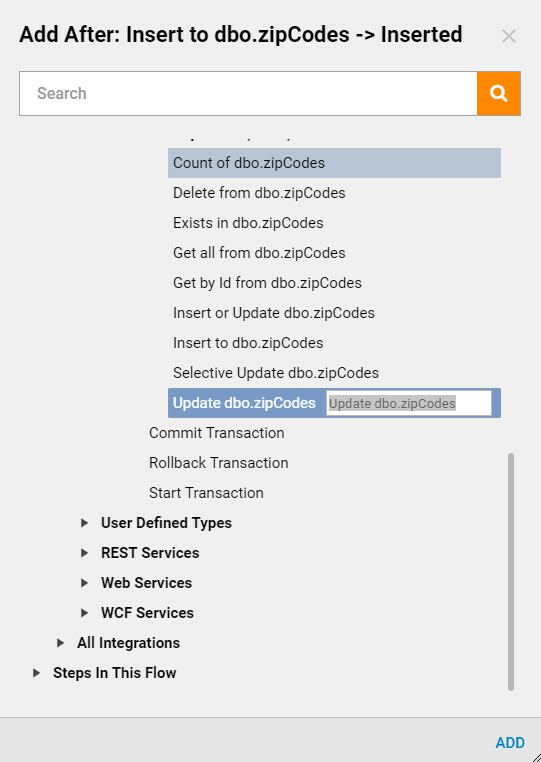 In the Steps tab locate Integrations > My Integrations > Database > Integrated Db Name(Database) > Get all from dbo.zipCodes [integrated table name]	, and connect the Updated Outcome	pathway to the step (Figure 9). We connect Failed	outcome from Get all from [table name]	step to the End	step in the Flow , and edit the step properties. This step does not require specific Input configuration. The only input that is configured is Limit of Records. In this case, we just ignore	this Input (Figure 10) . Mention, the data type that is being returned from this step. We will use this data type for the Data Grid	in the next step, which will be a Form . Select Add Step	to add the final step to the Done	outcome from Get All	step. Create a Form	to display all records from the table in the Grid	. 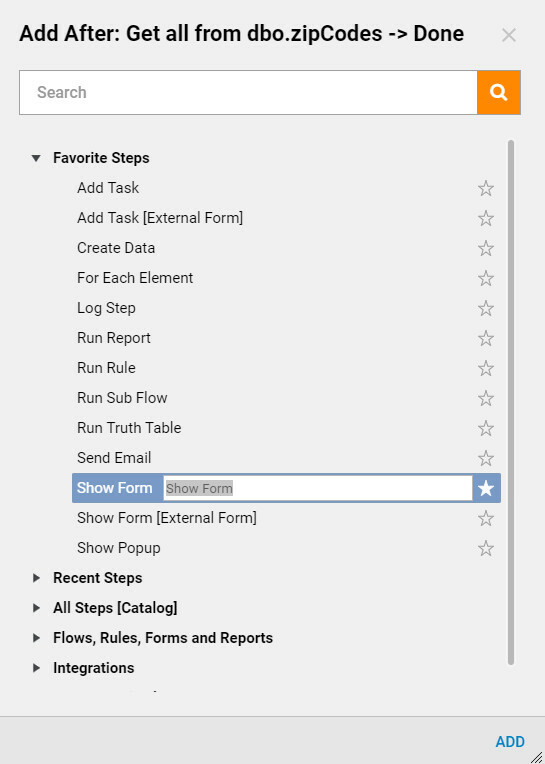 Add Show Form	step from Favorite Steps	category and provide this step with a Name. In the resulting window Name	the Form and click Create	to proceed to the Form Designer. Each Form should have at least one outcome. We add Button	component from the Actions	category in the ToolBox	to our Form . Then, name the text on the Button	to “Done”. Use a Data Grid	component to Display data from our table. Locate Data Grid in the components under Favorites. Next, we need to configure our Data Grid	component. 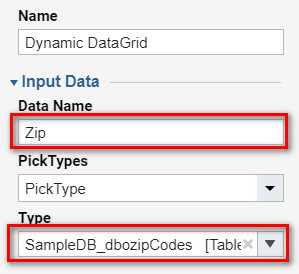 In order to display data from our integrated table, we need to configure Data Grid component to accept the appropriate Type	. 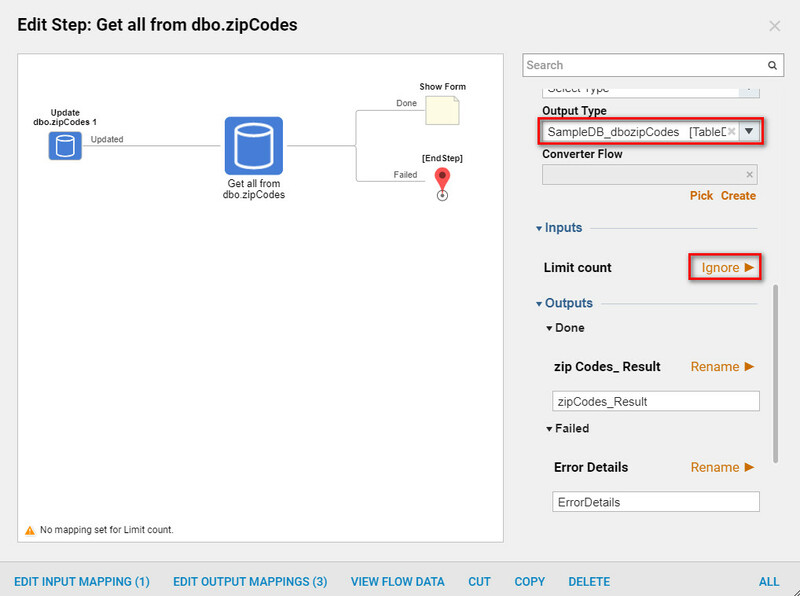 In this case, Type should match Data Type	that is coming out of the Get All	step (dbo.ZipCodes). Locate this Type in the Table Definition Types	category using Type	picker. After the Data Grids properties are defined with a name and the dataType, define the columns that will be displayed on the grid, under column information. Under Output Data	select the output mode, for this example the InfoOnly mode will be selected from the drop-down selection. 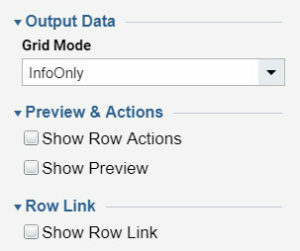 Moreover, we can add Row	actions and Row Links	to the Data Grid component (Figure 15). When we finished with Data Grid component, we can Save	and Close Form Designer to return back to the Flow Designer. In the Flow designer we connect the Outcome	from our Form to the End Step	. Then, we click on the Form Step	and select Show Mapping Editor	option. 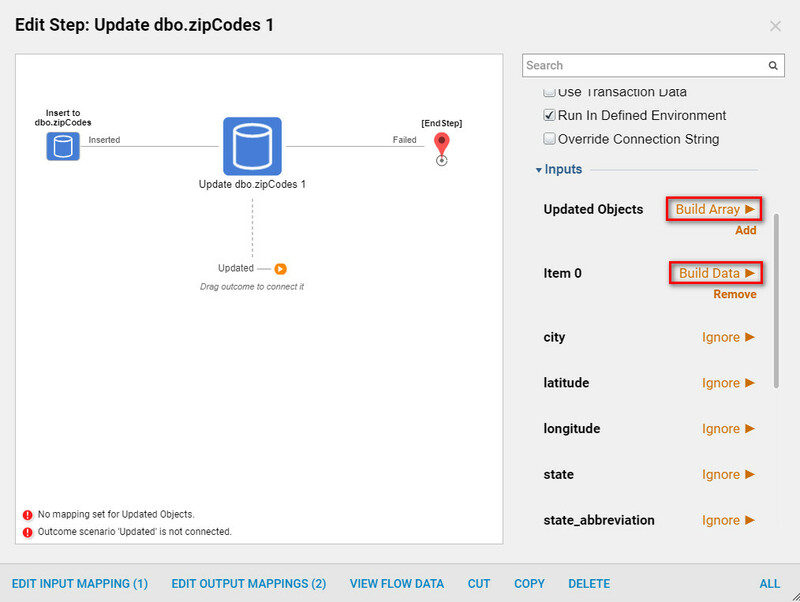 In the Mapping Editor we map outcome data from the Get all step	to the Data Grid	component Name	in our Form . Then, click Ok	to close Mapping Editor. This completes our Flow . 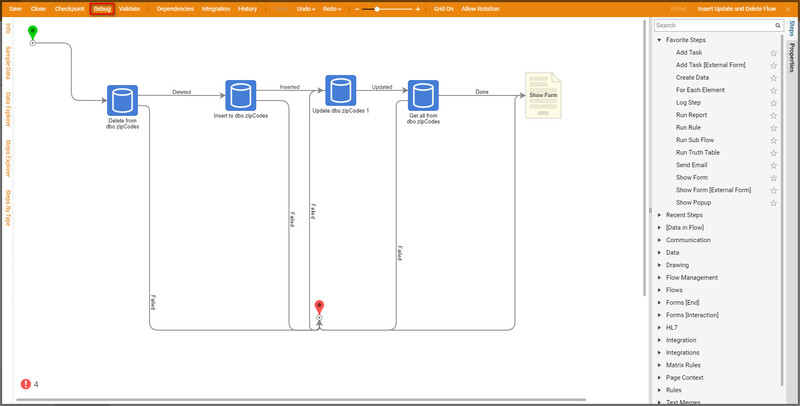 To test it we click Debug Flow	link on the top panel of the Flow Designer . Our Flow runs in the Debugger	and first thing that we see is our Form. Behind the scenes our Flow	does all work as we designed. Our Form displays the records from our database table with changes that were done by our Flow . Debugger	indicates that our Flow ran with no errors. Look at the original database to onfirm that the Flow did design changes to the table. This completes this Flow example using Insert, Update and Delete steps.